Sometimes, the latest is not necessarily the greatest. The new enhancements camera manufacturers offer on their professional model lines mean nothing to those shooting in the field. Whether it’s a photojournalist in a war zone or a fashion photog at a runway show, they want reliability and ease of use over almost all else. Given this range of possibilities, selecting the 10 best cameras for professional photographers can easily become an opinionated and sometimes snarky debate. That’s why the ‘best’ camera for each pro depends on what they’re familiar with. They need the model that gives them the range of options they need for their type of work. Landscape is different from studio. Shooting a sports event means fast action, while shooting a dog show or a wedding requires close-up work. The clear leaders in the field have been Canon and Nikon. An array of good glass means the pros find their favorite lenses for any condition. Bottom line – a good camera in the hands of a great professional has the potential to produce great photos. #1 Canon EOS-1D Mark II Large SLR 3.37 lbs. #4 Fujifilm GFX 50S Midsize mirrorless 1.63 lbs. #5 Nikon D5 Large SLR 3.12 lbs. #6 Nikon D750 Midsize SLR 1.85 lbs. #8 Panasonic Lumix DMC-G85 SLR-style mirrorless .90 lbs. #9 Pentax K-1 Mark II 2.23 lbs. We’re staying out of the ranking game with this one. With the broad variety of shooting situations, no camera meets all needs. However, there are major contenders for bodies used by award-winning or commercially successful still-image professionals. Their criteria become ours. Each camera excels in specific shooting situations, a function of camera type, weight, and features. For your needs, check our focused features list and dig deeper for the things that make photography successful, meaningful and fun for you. There is no one best solution for all professionals or all circumstances. Sensor size/resolution leads our list of criteria important to professionals, primarily because it decides the density of points in the frame. A bigger sensor means a sharper image, as well as greater range into low light situations. The greater number of megapixels (MP) will not mean as much to the quality of the image as the size of the sensor. The higher the number in the ISO range, the more sensitive the digital image-taking is to the amount of light available, with the offset being graininess in the image quality. The opposite end is true, too – brilliant light means cranking down the ISO, but it can also produce superb clear images. Coupled with maximum shutter speed (expressed in seconds, s or sec) and continuous shooting frame per second (fps), a camera can do a lot – or a little. Autofocusing options impact best use shooting conditions through both type and add-ons. Contrast Detection improves fine details, while Phase Detection maximizes the autofocus (AF) abilities of the camera for movement or action situations. Face Detection locks focusing on faces and holds it there during subject reframing. Image stabilization (IS) is essential at dawn or dusk or indoors when the light is low, for telephoto shots, or when a higher aperture setting is being used. Yes, shaking and resultant blurring can be minimized using of a tripod, but that’s not always an option. Not all bodies have IS, but lenses can make up for the shortfall too. Video has become an increasingly important feature, primarily because photogs often want to be able to add this to their stills of a scene. Not all cameras in our comparison have 4K resolution DSLR video as a feature, but some pros may not find that important. Still capture capability from video is a nice added feature when available. Most of these cameras do not have a built-in flash, making the three that do stand out. All have a flash shoe for the addition of external flash. If you regularly add light to your shots, the built-in may be enough to bridge the gap for you with one less piece of equipment to carry. As with any interchangeable lenses, what you put on the camera makes a difference in what you get out of the shot. Not all DSLRs or mirrorless cameras offer the same options in terms of lenses, whether they are a dedicated line or can mount various brands. Functionality is not the same across the board, either. There is a lot to think about. It all depends on what kind of shooting you think you’d like to do. Think like a pro and limit your selections (because you won’t want to only have one) to those meeting most of your regular photography needs. Or buy two – if your bank balance and aspirations can afford it. Again, no ranking or rating is implied in this listing. We went with alphabetical order, just to be fair. First, we’ll break down some of the high-level data points for each camera in another table (below). Then, we’ll jump into our detailed reviews. 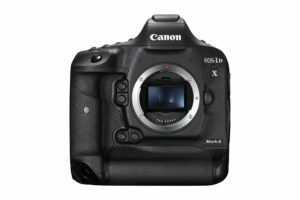 If the previous generations of this crowd favorite were drool-worthy, the Canon EOS 1D X Mark II might have surpassed them all and then some. A good camera choice under any condition, it excels in fast action or continuous shooting situations. It supports the Canon brand’s position as the number one camera choice of professional photographers and photojournalists around the world. This large-bodied DLSR comes loaded with features You almost need to ask instead, what doesn’t it have? It excels in imaging quality with fast continuous shooting of 16.0 fps and 61 focus points. Its 4K Ultra-HD video resolution meets the needs of photographers adding to their stills storytelling without changing cameras. Most of all, this camera gets high marks for durability and ease of use. In those cases when being able to shoot fast without a lot of setting changes is important, the Canon EOS 1D X Mark II provides both the flexibility to make modifications quickly and a reliable platform to ensure you are getting the shots you want. This Canon makes it easy to do a job without thinking about how to command it to function. Its native ISO range can be pushed to 50-409600, allowing for those fast movement shots without subject blur. Image files can be saved in RAW format, making later editing a more flexible experience. The 100% viewfinder means the shot you see is the shot your camera captures. Touch controls on the larger than average LCD screen allows you to change settings with the touch of a finger and mark the focal point of your shot. The LCD’s resolution again makes using the 1D X II a process you don’t have to struggle with. Controls are intuitively placed, with added features such as ports and shoes for every conceivable attachment, and built-in wireless connectivity to transfer images after a shoot. Because it uses the Canon EF lens series, compatibility with other Canons is assured. This means investments in glass can be shared across other professional Canon bodies. This is a big camera, and by big, we mean heavy, as in almost a half-gallon of milk heavy without a lens. Its weight also means it is not ideal for daily use, since it would be considered more luggable than an extension of your arm. For shooting situations where adding a big lens is mandatory, make sure there’s a tripod handy as the 1D X II does not offer image stabilization (IS). Some lenses in the EF series come with IS, but again, support for body and lens is highly recommended. Imagine shooting from the sidelines of a football or soccer game or clicking stills of an active crowd scene you want to isolate in your frame. If these are your passions, this is the camera for you. Because it comes with environmental sealing, outdoor settings aren’t the risk they might be with other cameras. 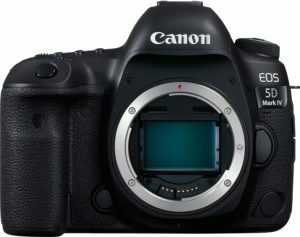 The improvements made in the Canon EOS 5D from model to model were minor enhancements or adjustments. Any of the Marks are solid workhorses, as you would expect from professional-grade Canon DSLR machines. However, the Mark IV repeatedly rises to the top in reviews for different kinds of pro photography, making it an all-around favorite. This camera wins praise due in large part to its full frame sensor and very high resolution of 30.0MP. It works for everything from fast action shooting to close-up compositions. The Canon EOS 5D Mark IV earns high marks for image quality and long list of features. For videography, the 5D IV includes 4K resolution and 4K photo mode where frames can be selected for stills. Its environmental sealings make it a durable camera for outdoor work when conditions aren’t at their best. The range of Canon EF series lenses offer something for every type of shot within their range, along with all-weather kit capability. For the photographer who wants a body to adapt to multiple shooting styles, the 5D IV is a solid contender. Its autofocus system has 61 focus points with 41 being cross-type, locking focus faster and more accurately. High resolution produces images that are crisp and detailed. Battery life is about average for comparable DSLRs, around 900 shots. Extra batteries are recommended for longer trips. Variable shooting conditions can allow batteries to last longer or be depleted more quickly. Some say this camera tackles deliberate photography better than other Canons. Settings encourage taking time for composition and use of myriad adjustments within its functions. Because of the breadth of its success in different conditions and the more reasonable semi-professional price point, it is an excellent midrange addition or selection as a primary body. Weight isn’t necessarily an issue, though it is heavy enough to discourage most from toting it around for daily casual shooting. Since it does not offer image stabilization, many recommend using a tripod for any shooting situation where maintaining a static position is useful. However, its autofocus and the IS available in lenses may make up for this shortcoming. Some reviewers argue that the low ISO range makes this a less-favorable choice for low light shots. Others counter that the higher pixel sensor compensates for this. This is probably more a matter of taste and of choice for selected shooting conditions. Moving up from a kit DSLR, the 5D IV is a good choice because of its range and flexibility. It consistently ranks in the top 10 of rating lists and meets the needs of both the enthusiast and the pro. If your shooting needs range across a broad spectrum, this Canon would be a great addition to your trendy photog bag. For those of you enamored with mirrorless cameras, Canon has responded with the Canon EOS M6. Its selfie-friendly LCD screen and better than average performance in low light make it a well-rounded selection for this list. The tote-friendly weight of under a pound (body only) encourages its use for everyday photos as well as professional settings where noiselessness is a must. 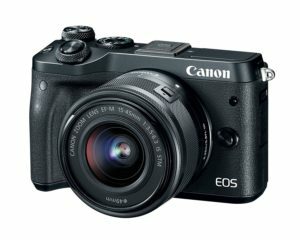 The Canon EOS M6 body alone is compact, almost the same dimensions as the Canon PowerShot line. Add a lens to the M6 from the broad selection of alternatives and you now have a camera that fits well in your hand if not your pocket. It offers a full-size tilt screen instead of a viewfinder, something that partners well with its overall portable size. One feature found only on this camera is a video image stabilization system. This does not translate into IS for stills, but it will help keep your framing steady for its full high definition capability. Considering this is a street camera meant to be shooting everyday scenes, you probably won’t have a tripod handy, making this system a true benefit. If self-portraits or group shots are your gig, the tilting LCD screen makes life easier. That LCD is also a touch screen, meaning settings can be changed and focus points marked with the tap of a finger. This translates into ease of use above that typically found in a DSLR. Reviewers love the M6 for the DSLR-quality pictures it produces, rating it as the best mirrorless image quality found in the class. Its ultra-light weight makes it easily portable. Mechanicals function, some say, like a Leica – high praise at a fraction of the price. It’s hard not to like the price. While most people spend their oodles of cash on their glass (which you can certainly do with the M6 too), the body price tag falls into the reasonably affordable range. While weigh and flexibility might lead you to believe this is a good daily body choice, two factors are detractors. The battery life is short – under 300 shots. The lack of environmental sealing would also make it the wrong camera to have with you on a rainy day or in the middle of a desert. The selection of native Canon EF-M lenses is narrow. However, the addition of an adapter allows the users to explore the full range of EF lenses adding autofocus and image stabilization capabilities. This does add significantly to the weight, again reducing its usefulness under some conditions. Perhaps best known for being a street camera, it’s as much about its size as its silence. Being mirrorless keeps it quiet, so the user won’t intrude on the scene. For those conditions where blending into the background is what you need, the M6 can ensure it won’t be your shooting distracting from the scene. 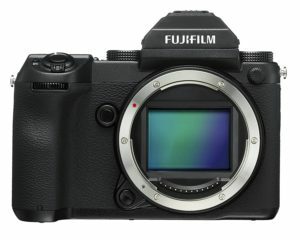 Another mirrorless that makes the grade of best in show is the Fujifilm GFX 50S, designed for the professional. With superior imaging quality and features, it consistently ranks at the top or nearby in ratings of mirrorless cameras. It generally receives an excellent score in all types of shooting situations, though some criticize its slow continuous shooting as a reason to avoid it for sports or fast action circumstances. The Fujifilm GFX 50S is not a casual camera. From its overall cost (body plus lens considerably higher than most other mirrorless options and competitive DSLRs) to its sophisticated shooting controls, this is a body for a serious photographer. While it offers weather sealing for more challenging conditions, it might not be the one to buy for high action settings where possible damage can occur. It also has bells and whistles many folks might not know what to do with. It is silent at electronic shutter speeds up to 1/16000, while its continuous max speed is a lowly 3.0 fps. Users can choose from 117 points in its contrast detection autofocus system, making it a great choice for still shots but less so for movement or sports. The GFX 50S has two big pluses – its medium format sensor size and its 51.0MP resolution, the highest available. That adds breadth and depth to possible shooting situations while maintaining image quality. It can also save files in RAW format, allowing a greater range of manipulations in post-shot processing. The LCD screen tilts for ease of access, and its high resolution and touch capability make it easier to use than other comparable cameras. A 100% viewfinder means what you see is what you get in the image. It has been deemed great in low light situations. This Fujifilm is heavier and larger than other cameras in its class. Some reviewers comment that the shape of the grip is not ergonomic, though that does not seem to be an issue for most pros. When you consider the lack of image stabilization and add the G series lens of your choice, the overall weight makes use of a tripod a good idea. The possible lens list for this Fujifilm is short – only six native lenses to choose from. Only one of these offers optical image stabilization. Battery life at 400 shots is average for this type of camera, which means extra juice for those longer outings is a good idea. If stills are your focus, this Fujifilm GFX 50S is a terrific choice. Controlling composition and settings makes it a wonderful selection for landscape or environmental perspective shots, while its autofocusing ups its attractiveness for portrait or close-up work. Affordability may hold you back, but if you want the top medium format hi-res mirrorless camera, get out the credit card. If you’re looking for a beast of a camera for those high-speed shots, the Nikon D5 is for you. With a large selection of available lenses and capability to mix and match with other Nikon bodies best for other purposes, this camera extends the arsenal for the professional. Yes, it is heavy in both the hand and on the wallet, but its features make it worth the price. The Nikon D5 has a lot going for it – speed, reliability, autofocusing, and long battery life to name just a few features. It excels in sports or fast action shooting, videography with photo capture, and situations where weather may be a concern. Expanded ISO to 3,280,000 makes it unique in its field. Weighing in at over three pounds provides both benefits, like LCD screen size, and challenges, like its lug-ability. It takes a big body to hold all it can do. In some ways, D5 sales may be cannibalizing other Nikon models, but it stands alone in what it does best. If sports photography is your gig, this is your camera. It has a fast shutter speed of 1/8000 sec, and continuous shooting of 14.0 fps, unique in its class. The incredible expanded ISO range creates super-crisp image details for fine art in the trenches, even in low light conditions. Autofocusing on the D5 is superb. Contrast detection AF delivers fine detailing, while phase detection offers the tracking capability for movement situations. Couple that with the 153 focus points of which 99 are cross-type and face detection AF, and the overall abilities are assured. A unique aspect in the 4K video is the ability to review those streams frame by frame in a computer-based editing software and extracting 8MP photos in 4K Photo Mode. In a sense, this gives you the best of both worlds, footage as well as stills. It is not a substitute for good still image captures, though. Yes, there is all that ISO range, but reviewers generally feel you will not use them on a regular basis. Most photogs begin shooting where they normally do, but find they get better results. Paying more for this feature may not bring enough return for the investment. Weight isn’t something to shy away from, and the body plus lens total is only slightly less than the usual sack of potatoes. For field work, like shooting from the sidelines, a tripod will be a standard necessity to maintain a steady hand. Consider portability too for sites where long walks are part of the agenda. Anything from the sidelines will be prime viewing for this camera. The D5 also shines in outdoor events where the excitement and action are high (think a political rally or concert). Indoor fast movement situations fit the bill too, making this a great machine for the sports or event pro or photojournalist in the field. This top-ranking DSLR is great for the serious enthusiast and the professional photographer, offering a range of uses and features. 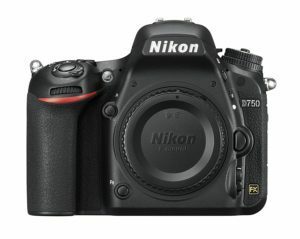 The Nikon 750 stretches the usefulness through a good balance of imaging quality, functions and features, and affordable DSLR price tag. While it does not have everything in the tank the D5 has, it will meet most high-end needs with ease. 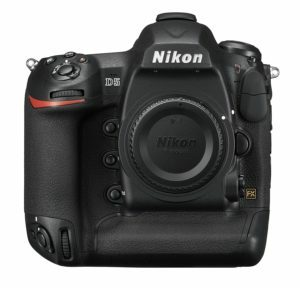 Adding to the family of bodies working with the Nikon F series lenses, the Nikon 750 offers something for everyone. Its average size and weight for its class and good ergonomics in the hand make it easier to use than some of its siblings. While it is not the highest resolution full frame camera, it accomplishes the photographer’s mission for close-up or fast action shots. While the LCD screen is large and offers a tilting feature, it does not offer the same resolution as higher-end cameras. It is still in the midrange for comparable bodies. The viewfinder covers 100%, helping to frame your shots and avoid cropping in later processing. Unlike many of the other cameras in this review, the Nikon 750 comes with a built-in flash, meaning you carry one less accessory unless you want to add an external flash on the shoe. Since it has the longest battery life of semi-pro DSLRs, you won’t be lugging along lots of extras there either. Autofocus options abound in the 750, including phase detection, contrast detection, and face detection. Of its 51 focus points, 15 are cross-type, locking on to your focus faster. AF performance is said to be exceptional, maintaining quality images even in low light shooting situations. One aspect sure to please the tech-savvy photog is the ability to control most aspects of the camera using a smartphone app. Camera settings, shutter release, LCD screen viewing, and file transfers can be controlled remotely. Built-in wireless connectivity adds to its user-friendly functions. The lower maximum shutter speed in the Nikon 750 turned many reviewers off. A smaller LCD screen offered less in terms of information. Battery life has also been shown to be less than average, even when operating in ordinary conditions. If videos are a regular part of your regime, this camera will probably not meet your needs with its lower resolution. Most reviewers feel it is adequate, but not a star of its features. If you’re looking for a camera with a balance of features and functions for still work, the Nikon D750 makes the grade. It won’t break the bank while providing durability and reliability in the field. Its solid semi-pro ranking offers you the ability to capture fast speed work and those wonderful close-ups in one camera body. While its weight keeps the Nikon D850 from being a favorite for street or daily life photography, it has something for everyone in every other category. Considered a semi-pro camera, it meets or exceeds the needs of most serious enthusiasts while adding bandwidth to the professional’s bag. It shares many capabilities with its more expensive siblings at half the price. 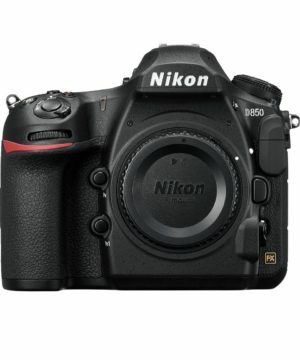 While it isn’t the very highest resolution out there, the Nikon D850 comes close at 46MP and a full frame sensor and is generally thought of as the top in technical performance in its Nikon class. It operates as a stellar option under a variety of light and movement conditions. Its weight might be seen by some as an offsetting negative, but the addition of a tripod can overcome this obstacle. Nikon is adding built in wireless connectivity to its latest models, and the D850 hasn’t been left out. It can also connect to your smartphone and to other devices that can use Bluetooth technology. That smartphone app allows you to change settings and release the shutter without touching the camera, a plus for complicated still shot framing. The LCD on the Nikon D850 is larger than the average for the semi-pro class and offers a touch screen capability to change focus point and settings, making it easy for on the go use. The max continuous shooting speed of 7.0 fps can be enhanced to 9.0 fps with the addition of an optional battery grip. Size and weight are then increased, but so is capability. The 850 excels in longer exposure shooting conditions. Night shots or anything where longer exposure for artistic effect is required benefit from the vibration-free shutter mode. If artsy star shots are your thing, this camera is your match. Video is captured at 4K, with a high level of detail and image crispness. Contrast detection, phase detection, and face detection make focusing a breeze. Of the 153 focus points, 99 sensors are cross-type, locking in that AF even faster. If you shoot a significant amount of highly patterned shots (like fashion), it is important to note the D850 lacks an anti-aliasing filter. While this increases the sharpness and detailing, it also increases the chances of moiré appearing in the image. This cannot be removed completely by any post-production software. Some reviewers criticize the contrast detection recovery time as not yet up to par. This live view mode requires the camera to analyze the contrast in the shot after it’s taken. The lag is enough to bug some photogs. The super-high resolution makes this an excellent choice for landscape or architecture work, allowing you to focus in on the fine details even in large framing. This is also a benefit for detailing in close-up shots. Shooting speed and autofocus generally make it a great body for action too. In the mirrorless market, size and silence matter, but so does flexibility and compatibility with accessories, like lenses. The Panasonic Lumix DMC-G85 (sold in some countries as the G80) scores on all counts, with a few DSLR extras thrown in. When stealth and going unnoticed matter, this camera might be your new best friend. This is a solid selection for those up close and personal situations where the photographer needs to blend in rather than stand out. 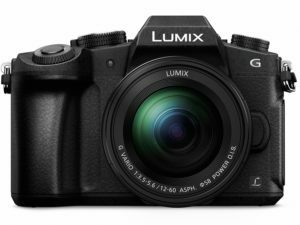 The Panasonic Lumix DMC-G85 is versatile and user-friendly without the addition of heavy or pricey add-ons. The comfortable feel of the body in your hand couples with the best mirrorless offers. The G85 includes image stabilization, 4K video with 4K Photo Mode for still captures, and a wide range of available lenses. The fully articulated LCD with touch controls. For those of us who prefer to shoot mirrorless, it can do a lot for a reachable price. Sensor-shift image stabilization within the body compensates for camera shake and offsets the potential for blurred images. This is a good feature to have when shots need to be fired fast with little time for finer composition in street or daily scenes. Its built-in flash extends its usefulness, even though it does not function as well in low lighting. The use of Micro Four Thirds (MFT) lenses is a big plus. This lens mounting system offers the greatest number of possible lens options, and not only from Panasonic. This range of possibilities almost makes up for the issues with image quality that its sensor and resolution create. Something that sets the G85 apart is what can be done to manipulate focus. With Focus Stacking, the camera uses focus bracketing to composite multiple shots of different focal positions in a single image, maximizing depth of field. Post Focus Mode and 4K Photo Mode do something similar using 4K video images played through the LCD screen. With smaller size and portability come offsetting reductions in capabilities. The Panasonic Lumix DMC-G85’s Four Thirds sensor size, coupled with its 16.0MP resolution makes it less than spectacular at landscape or larger format shots and poor low light performance. This Panasonic is heavier than other mirrorless cameras and slightly larger in the hand. Some reviewers feel the G85’s limited autofocusing options are a strong negative. It lacks phase detection AF, which means it does not function as well in situations where the subject is moving. This is somewhat offset by its 9.0 fps continuous shooting speed. Picture yourself in any setting where blending in so you don’t change the feeling of the shot is critical. The G85 can help you remain inconspicuous. If this kind of art or journalism is of interest to you, this Panasonic should be too. Reviewers like the Pentax K-1 Mark II for all types of shooting circumstances. Considered full of features for both the serious enthusiast and the professional, the only complaint could be size and weight. The range of available lenses makes this a good choice across skill levels and situational settings. 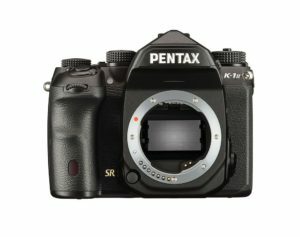 As of this writing, this Pentax K-1 Mark II is relatively new and not everyone has yet had an opportunity to test drive its capabilities. It embodies enough advances over the K-1 to make it a contender in this best-of list. The highly praised qualities from the original K-1 are still there for the brand-committed user. The high ISO ratio and relatively high 36.0MP full frame sensor make this body one for a range of circumstances. It can save images in RAW format, offering more options in post processing. It utilizes a wide range of native lenses for any occasion. Imaging shines in the K-1 II. The biggest one worth mentioning is the high-resolution mode. This combines multiple images using its sensor shift image stabilization system to create a higher resolution image. This works best when using a tripod in static scenes. As we noted in a previous listing, highly patterned shots with repetitive designs may be subject to imaging issues because the K-1 II lacks an anti-aliasing filter. Unique to this camera is the anti-aliasing simulator mode, acting as a low pass filter to avoid moiré in your images. This is the only camera in our analysis with this capability. If shooting the night sky is something you love to do, this camera may be the only one meeting your specific needs. It offers an astro tracker combining the sensor shift with GPS capability to track the motions of the stars. It will create unique long exposure images of star movement without trails. While the K-1 II uses contrast detection, phase detection and face detection autofocusing, it does have some drawbacks. The 33 focus points are lower than some competitors, with 25 of the sensors being cross-type for more rapid and accurate focusing. However, this was not mentioned by a significant number of reviewers as an issue. Other issues raised include a shorter battery life compared to other cameras in its class. Video quality is not up to 4K standards, so if this is an important part of your shooting regimen, beware. Its large LCD fully articulating screen is not a touch model. Across the board, the Pentax K-1 II checks all regular boxes for shooting circumstances across possible conditions. This makes it a terrific all-purpose camera, and given the lens choices, it can reach as far as the photographer’s skills. Because it is weather-sealed, it is as appropriate for the outdoors as it is in the studio. Neck and neck with our earlier listed Fujifilm camera, the Sony Alpha A7R III ranks high in reviewers’ opinions on imaging quality, features and value for the price point. This mirrorless camera offers the highest number of focus points of any camera in our short analysis. Its excellent rating on all shooting levels makes it the best all-around mirrorless body on our list. This professional level camera incorporates the best features you expect to find in a DSLR with the functionality of a mirrorless body. The Sony Alpha A7R III checks the boxes for a strong combo of full frame and high MP resolution in its sensor. Add fast shooting speeds coupled with good low light performance and it becomes equipment for almost any shooting situation. Lens selection for this body stretches beyond what Sony offers to third party manufacturers. Sony makes extending your choices easy with an adapter for other brands, even as it keeps adding native lenses to its list. Its sensor based five-point image stabilization system is one of the best in interchangeable lens cameras. 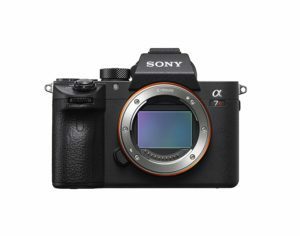 Flexibility ranks high for the Sony Alpha A7R III, translating into a camera that fits almost every conceivable condition for the pro photographer. Its weather resistance makes it a good outdoor model, while its silent shutter lets you blend into the background indoors. At a max shutter speed of 1/8000 sec and a continuous speed of 10.0 fps, you can cover a lot of ground under marginal shooting circumstances. Autofocusing includes the standard contrast detection, phase detection, and face detection. What stands apart is the whopping 425 focal points to choose from. The eye tracking AF feature makes portraits a breeze, particularly with fast lenses and narrow depth of field. This camera has the longest battery life in its class, twice the expected average. Its shape, placement of controls and settings, and ergonomic design utilize the body well. The tilting LCD touch screen makes changing settings a breeze. Again, and one must wonder if this is a competitive trend, the A7R III lacks a low pass anti-aliasing filter, making the risk of moiré increase. Depending on your shooting preferences, the offsetting increased sharpness and detailing may be more important. This cannot be removed completely by any post-production software. This camera does not have a built-in flash, perhaps the only real feature it’s missing. Weighing in at a pound and a half, some reviewers were critical of the heft, while others thought it wasn’t an issue. The addition of good glass might necessitate the use of a tripod in some situations. The A7R III’s image stabilization system offsets those concerns to some degree. Pick your shooting situation – the Sony Alpha A7R III will match and expand your people, places and events skills. As they say, a good camera needs the abilities of a great photographer to shoot exceptional shots. In the hands of developing photog, the A7R III makes up for deficits and then some. Yvonne Kohano captures storytelling images of travel destinations, food and wine, and gardens and nature. 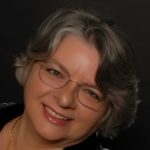 She is a fiction author of romantic suspense and psychological thrillers, book/business coach for creatives, and nerdy student of human behavior and the natural world.